Genevieve Jerman Wilklow, 83, died Thursday, April 20, 1995, at her daughter's residence, 5134 Cindy Lane, McKean. She was born in Rushford, Allegany County, N.Y., March 30, 1912, daughter of the late Homer and Martha Powers Jerman. She lived in the Rushford and Belfast area of New York for most of her life. She had taught school in the Rushford Central School District for 26 years prior to her retirement in 1972. She was a member of the Retired Teachers Association, the Belfast Senior Citizens and St. Francis Xavier Church in McKean. 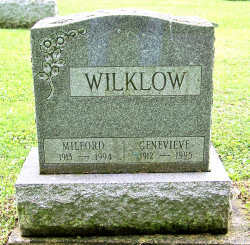 She was preceded in death by her husband, Milford G. Wilklow, in 1994. Survivors include a daughter, Mrs. Peter (Jean) Fox of McKean; a son, Richard J. Wilklow of Rochester, N.Y.; four sisters, Rita Jerman of Olean, N.Y., Barbara Jerman of Belfast, N.Y., Katherine Burr of Fillmore, N.Y. and Hilda Hollister of Bolivar, N.Y.; a brother, Arthur Jerman of Belfast, N.Y.; eight grandchildren; and three great-grandchildren. Friends may call at the Treusdell Funeral Home, Belfast, N.Y., Sunday from 7 to 9 p.m., and may attend a funeral Mass at St. Patrick Church in Belfast Monday at 11 a.m.
Burial will be at Riverside Cemetery, Belfast. Memorials may be made to Hospice Services, V.N.A. of Erie County, 1305 Peach St., Erie, 16501.
ii. Richard J. Wilklow was born on 3 December 1945 in Fillmore, Allegany Co., NY. He married and has children.